Top quality litho-printed NCR Sets for clean copies without the need for carbon paper. See 'More Details' for further information. You will need to state the starting number you require in the additional comments box when placing your order. NCR (No carbon required) sets from Flexpress are perfect for a variety of uses where a no-fuss copy is required instantly. Normal pressure from a ball-point pen or impact printer onto the top copy produces clear legible copies on subsequent sheets below without the need for messy carbon-papers. The paper is specially treated so when the molecules of one sheet are crushed and mixed with the molecules of the next sheet, the colour changes and hence a copy is produced. Consisting of 2, 3 or 4 parts tip glued using special glue that separates into sets thus eliminating the need to collate together different pieces. Each part can have a unique colour for easy identification. 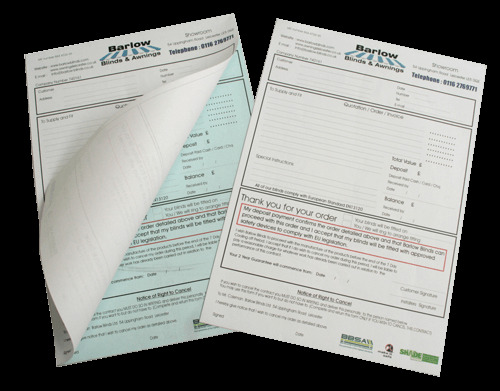 Amongst the uses for NCR sets are: invoices, statements, receipts, membership forms and agreements. 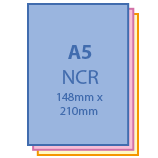 4 part (NCR) sets are available as a white top sheet followed by yellow, pink and green sheets or blue yellow and pink sheets. These colour combinations come as pre-collated sets. Other colour combinations are available by custom quote. Our NCR sets are all printed lithographically which guarantees accurate registration between sheets and reproduction of fine lines and detail. NCR sets use pre-collated materials for speed and efficiency. These are then tip glued into self separating sets. Sequential numbering is also available if required (please don't forget to state your starting number when placing your order). All products are packed in strong double-wall corrugated packaging to minimise damage in transit. Please note: all parts are printed identically i.e using the same image to the front. If two-sided print is requested a second image (such as terms and conditions) can be printed onto the reverse side of each sheet. You can also add sequential numbering as an option. Please state the starting number you require on the other information form at checkout. Why Flexpress for NCR Sets?